ShelterBox provides emergency shelter and essential survival equipment in a single unit. ShelterBox produces watertight plastic boxes which contain durable supplies meant to temporarily shelter and sustain a single family. A purpose-designed tent provides shelter. The box also contains blankets, a cookstove and utensils, children's toys and other supplies chosen for the disaster at hand. The entire unit weighs approximately 100 pounds and is easy to carry and transport. Every year hundreds and thousands of families across the world lose everything when disasters strike. Through no fault of their own and often with no warning, families lose their homes, their possessions and their livelihoods. Every day they are faced with a battle for survival and our mission is to help them. We provide emergency shelter and lifesaving supplies for families around the world who are affected by disasters at the time when they need it the most. Our Founder, Tom Henderson OBE, saw the humanitarian response in most disasters was in the form of food and medicine. Little or no assistance was being given in terms of safe, secure shelter to help families survive the first days, weeks and months as they try to rebuild their lives. ShelterBox was created to fill this void. Since our inception in 2000, we have responded to earthquakes, floods, volcanoes, tsunamis, hurricanes, landslides, typhoons and conflict, delivering emergency humanitarian aid to families in need on every continent. 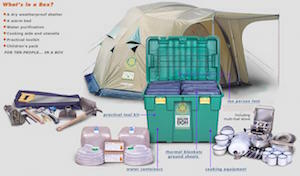 The ShelterBox solution in disaster response is as simple as it is effective. We deliver the essentials a family needs to survive in the immediate aftermath of a disaster. Each large, green ShelterBox is tailored to a disaster but typically contains a disaster relief tent for an extended family, blankets, water storage and purification equipment, cooking utensils, a stove, a basic tool kit, a children’s activity pack and other vital items. We rely on public donations and could not operate without the generosity of people the world over. Our supporters constantly go the extra mile to help make a difference to the lives of families who survive disasters. We have had fundraisers climb Mount Kilimanjaro, row the Atlantic, cross India in a Tuk Tuk and even cycle 10,000 miles on a tandem. Every box we send out bears its own unique number so our donors can see where the box they have sponsored has gone.